My father, a lifelong entrepreneur, died when he was 49. He left his family a solid will and a thriving business, which has sustained a wife, three sons and a nephew for 16 years. Aside from these two very important things, my dad did little in the way of estate planning. Now my mother is experiencing a health crisis, and was recently admitted to an assisted-living facility. My brothers and I have been urging Mom to get her financial affairs in order, and over the past few months the family has had a crash course in estate planning. 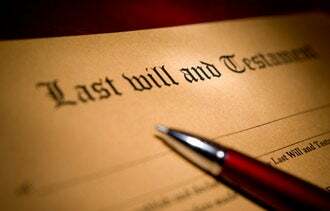 A will provides clear, legally binding instructions about what happens with your money and possessions after you die. Simply telling relatives what you want to happen isn't enough. Without a valid will or living trust, your state's laws determine where your property goes after you die. A living trust (or revocable living trust) helps your survivors avoid probate, the court process used to pay debts and distribute property to heirs. Some living trusts reduce taxes or protect financial privacy. A living trust doesn't replace a will, but is worth considering (in addition to a will) if your estate is valuable. A living will (or advance medical directive) tells your family what to do if you're incapacitated or terminally ill. This is the document you need if you don't want to be kept on life support. With LegalZoom.com and LawDepot.com, you fill out an online questionnaire and the company uses the info you provide to create the documents you need. Quicken WillMaker is desktop software that guides you through the process of creating an estate plan. Using resources like these, you can put together a simple will in less than an hour. But be warned: These tools are aimed at folks with basic needs. The documents they produce are better than nothing, but your best bet is to contact an attorney. --J.D.R. With a durable power of attorney, you can appoint somebody you trust to take care of your financial affairs when you can't. Because my mother granted me power of attorney, I'm now able to pay her bills, cancel unused credit cards and more. Without, the family would be powerless. Life insurance is important if anyone (such as your spouse or children) depends on your income. For most, term life insurance is best. How much? There's no hard and fast rule, but your policy should provide enough for your survivors to cover immediate expenses and meet financial goals. Though often overlooked, disability insurance is also vital. You're far more likely to become disabled than to die prematurely, and the loss of income is just as real. If you and your family need your salary to live on, you should have disability insurance. If we'd done research earlier, long-term care insurance would have been useful for my mother. A policy would have defrayed the costs of a nursing home or assisted-living facility. But because we waited, Mom's not eligible. Estate planning isn't over once you create the initial documents. When you experience any major life change--you get married or divorced, have children, move to another state or change careers--review your will and other documents to be sure they're still valid and reflect your intentions.